First aid is the immediate care given when a person is injured or suddenly ill.
First aid does not take the place of proper medical care provided by trained first responders and medical professionals. It involves providing temporary assistance until competent medical care is obtained, if needed, or until the chance of recovery without medical care is assured. Persons providing first aid must know the difference between a minor injury or illness and a life-threatening one. Chest or abdominal pain or pressure. Bleeding that does not stop after 10-15 minutes. Gaping wound with edges that do not come together. Your workplace may have specific procedures for contacting emergency assistance. A description of the incident and possible injuries. The number of persons needing assistance. 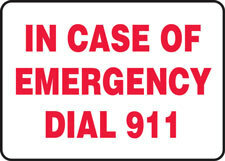 After providing this information, do not hang up the phone until the dispatcher instructs you to do so. Source: First Aid, CPR and AED, American College of Emergency Physicians, sixth edition.